I sure did have a hankering for tacos, and I was psyched to have the opportunity to visit Richtree Market‘s new Taco Bus at the lower floor, right by the Queen Street entrance of Eaton’s Centre. The 12 o’clock bustle will be hard to miss, this taco bus is a big deal around here! With an exciting introduction from Chef Andre on how this flip top 1967 Volkswagen Bus came to be, strung from urges of creating something all authentic of fresh ingredients, presented differently. 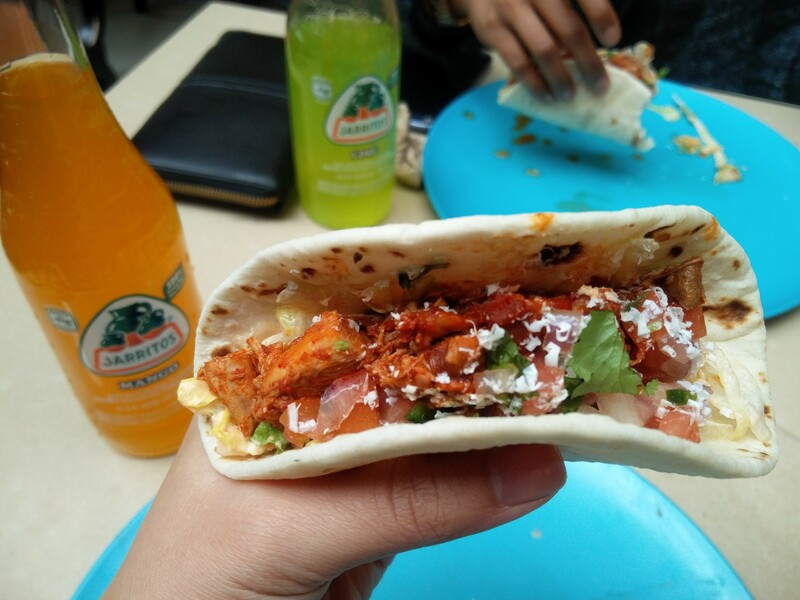 The Richtree Market itself has a fine reputation of customizing your ideal lunch to your preference, from options of pizza, salads to sweets, this Taco Bus fits in well to the lunch scene. 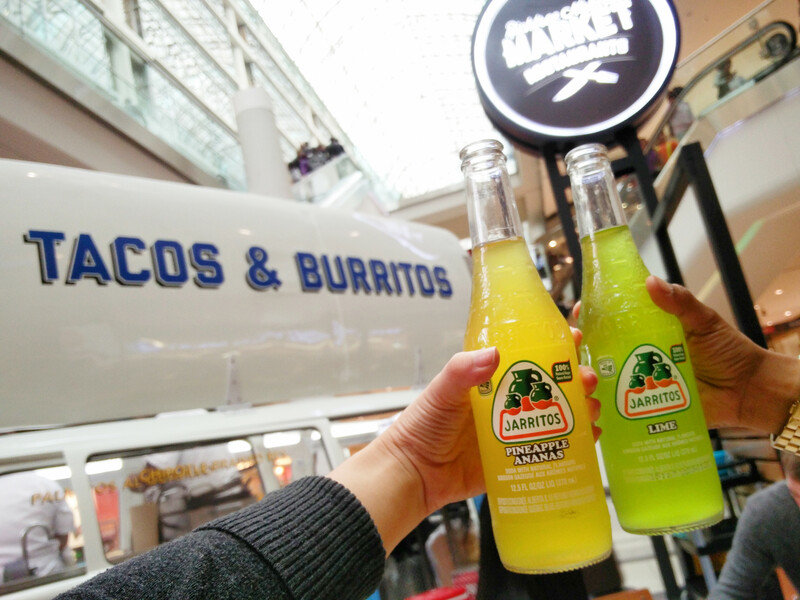 There is only one non-alcoholic beverage that is more suitable to pair with a freshmade taco, the Jarritos! In flavours of pineapple, lime and mango: it’s fizzy and refreshing characteristics will make you wish that you were instead knocking back these bottles on a sunny patio with the sun on your back and a dripping taco in the other hand…The tacos will swoop you up as as authentic as you can grab at a quick-stop spot. You can truly taste fresh in every bite. 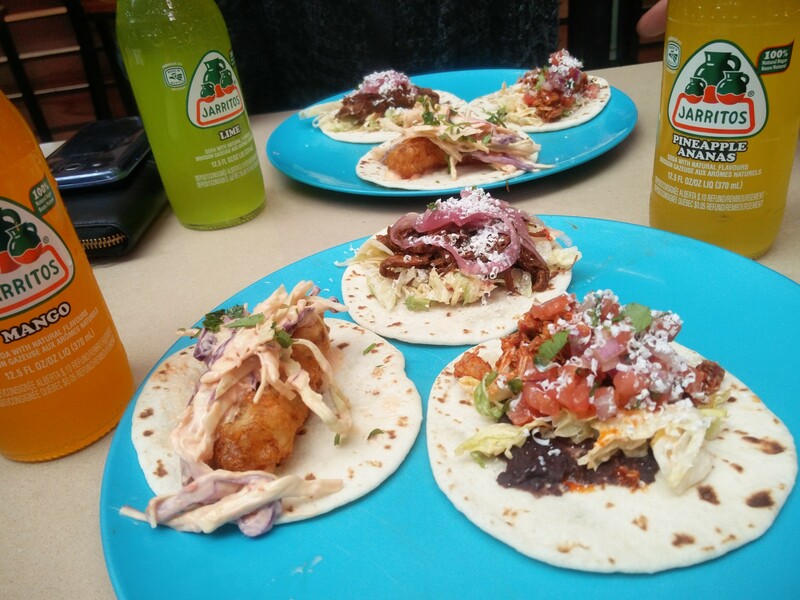 Each taco variety had a topping combination that was both crisp and flavoursome, with pickled onions, shavings of cotija cheese and cilantro. No two tacos were in any way the same; sauces of salsa verde, xni pec and chipotle lime sprung the protein in each to life. The chicken, spicier to some, but perfection to me – had the right amount of fresh spice. I’m only more curious of the last taco option, the Heart of Palm made with artichoke! Warm, soft braised beef tortillas ready for loving. The Richtree Market’s Taco Bus space holds two friendly crafters, preparing tacos and burritos with fresh and daily-made ingredients right before your eyes! Taco varieties of fish, beef, chicken and heart of palm (vegetarian) are created in either form (with the exception of a fish burrito), it’s a quick-stop delight for a lunch! 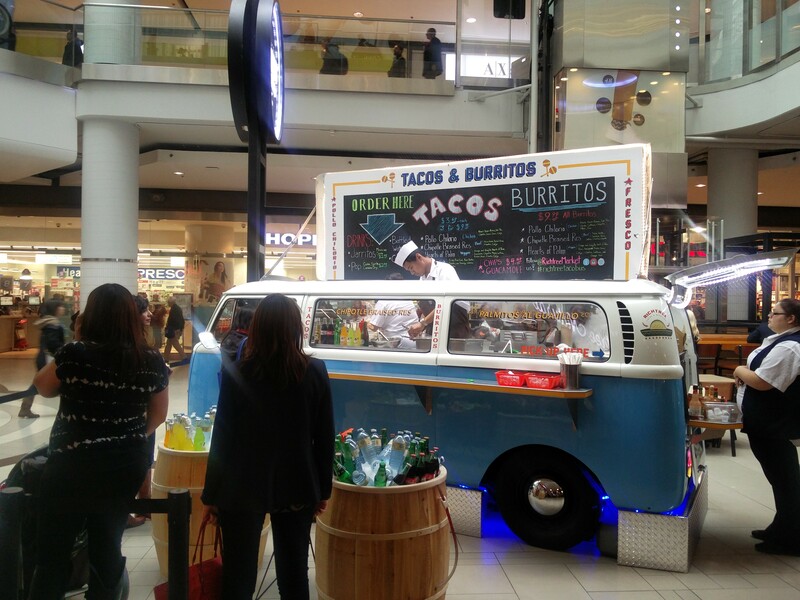 Word is on a Taco Bus extending to Richtree Market’s front in Square One, Missisauga… there is lots to come! Also, a new and exciting “Taco Tuesday” is upon us with a new taco feature, every Tuesday – that’s definitely one to stop in for!